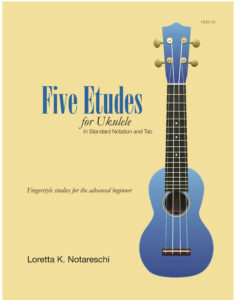 Many thanks to Samantha for her blog post on the Etudes. 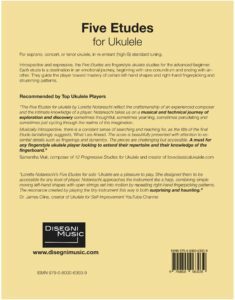 For soprano, concert, or tenor ukulele, in re-entrant (high G) standard tuning. Introspective and expressive, the Five Etudes are fingerstyle ukulele studies for the advanced beginner. Each etude is a destination in an emotional journey, beginning with one conundrum and ending with another. They guide the player toward mastery of certain left-hand shapes and right-hand fingerpicking and strumming patterns.